Treat your palate to six top-rated blends from the masters at Oliva Cigars. Presenting a range of expertly-crafted vitolas and tasting profiles, this elegant sampler box holds a world of fine flavor for the seasoned smoker and newcomer alike. Outstanding cigars at a great price. the cigars was very good, i love them but they are some was lil dry. since the day i got them. other then that everthing was good. First oliva sampler first fell in love. I initially purchased this so my husband would have the opportunity to try a higher rated cigar. He likes to receive it as a surprise in his order as I place all his orders. I've also purchased as a gift for a friend and he enjoys it as well. 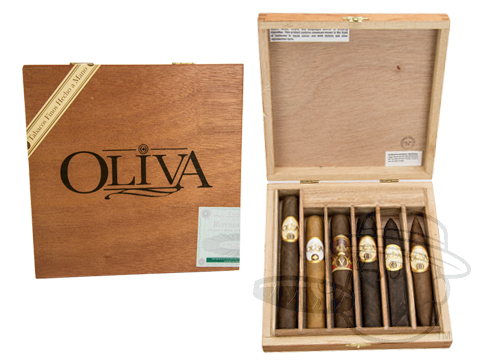 Oliva 6 Cigar Sampler is rated 4.9 out of 5 based on 7 customer ratings.